Recreational vehicles allow families the ability to roam the open road without having to worry about foods or hotel room stays, and allows families the chance to camp out wherever they can park their RV. This can be a wonderful investment in any household and it is important that owners take great pride in protecting their investment over the course of time. One way to ensure proper care and attention to their vehicle is with safe and proper self-storage. In Redlands area, it is against the law for RV owners to leave their vehicle stored in their driveway or on city streets. This leads many owners to educate themselves about storage facilities in the area to find a place to keep their vehicle when not actively in use. 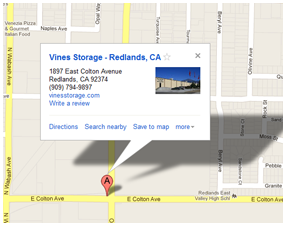 Vines Storage in Redlands, California can help. Vines Storage is a warehouse facility that provides indoor and outdoor storage. Many RV owners prefer to invest in indoor storage units at our facility to protect their RV from the elements of weather. This can help extend the lifespan of their vehicle and save them money over time in maintenance. Our facility offers safe, monitored access to the warehouse with a number of cameras and 24 hour video surveillance. We provide locked units and open space lots for individuals to park their cars, boats, or RVs, as well as personal belongings in storage units ranging from 5' x 5' to 20' x 20'. We provide both short-term and long-term leasing solutions which can be used to protect small items and large investments. We work with customers to develop a storage unit option that fits their budget and needs. Our facility also provides a number of amenities for RV owners including compressed air, filtered water, ice, and a waste dump station. We also provide other services to RV owners which include detailing their vehicles and washing them. The prices vary and customers are welcome to ask our facility manager about adding these options into their storage unit costs. Interested in learning more about safe and affordable self storage facilities for RVs, boats, and cars? Contact Vines Storage today!